Don't miss out on this great event! Bring your crew for a free lunch, pick up give away items, and enter for your chance to win a wide variety of door prizes. 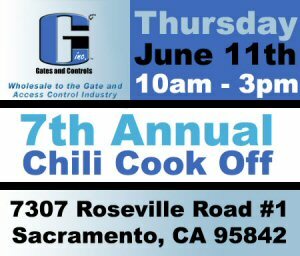 BD Loops will be at the chili cook off showing off their brand new saw-cut loop sealant BD-LG (loop goop). BD-LG is a polyurethane loop sealant with a flat 3/16" sealant tip. BD-LG is available in both gray and black. Polyurethane sealant has many advantages when compared with other commonly used sealants. •	Does not shrink or crack -it does not have an evaporation cure like most other sealants. •	Does not conduct electricity- water based sealants can facilitate shorts to ground. •	Has a low viscosity (flows easily) is easier on your hand, and is self leveling. •	Can be cleaned up with rubbing alcohol. •	30oztubes- most rubber and water based products come in 28oz tubes. BD-LG has nearly 7% more sealant. BD Loops is a manufacturer of preformed direct burial and saw-cut inductance loops for the gate, door, and parking industries. With over 14 years in business the quality of BD Loops is unparalleled. BD Loops products are available through over 350 distributors in the U.S. and Canada. BD Loops offers 46 standard preformed loop sizes, all standard and custom loop sizes are ready to be shipped the same day. Visit http://bdloops.com. to learn more about the products BD Loops has to offer.